Honolulu /ˌhoʊnoʊˈluːluː/; Hawaiian: hono'lulu) is the caipital o an the maist populous census-designatit place (CDP) in the U.S. state o Hawaii. Although the name "Honolulu" refers tae the urban aurie on the sootheastren shore o the island o Oahu, the ceety an the coonty are consolidatit, kent as the Ceety an Coonty o Honolulu, an the ceety an coonty are designatit as the entire island. The Ceety an Coonty o Honolulu is the ae incorporatit ceety in Hawaii, as aw ither local govrenment entities are admeenistered at the coonty level. Honolulu is an aa referred tae as the business an trade caipital o the Paceefic, an it is the lairgest ceety in the Sooth Paceefic alang wi bein the Unitit States maist soothwasterly lairge ceety. The population o the CDP wis 371,657 at the 2000 census, whiles the population o the Ceety an Coonty wis 909,863, makkin it the 57t-lairgest metropolitan aurie in the Unitit States. 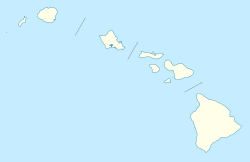 Honolulu is an aa the maist populous state caipital relative tae state population. In the Hawaiian leid, Honolulu means "sheltert bay" or "place o shelter". Honolulu haes been the caipital o the Hawaiian islands syne 1845 an gained historical recognition follaein the Japanese attack on Pearl Harbor naur the ceety on 7 December 1941. ↑ "Town" is a commonly used local nickname for Honolulu, in reference to the fact that the Honolulu, or "Town" side of the island is the most urbanized and dense part of Oahu. ↑ "About the City, Official Website of the City and County of Honolulu". City and County of Honolulu. City and County of Honolulu. April 24, 2012. Retrieved April 24, 2012. ↑ "Geographic Ientifiers: 2010 Demographic Profile Data (G001): Urban Honolulu CDP, Hawaii". U.S. Census Bureau, American Factfinder. Retrieved May 25, 2012. Wikimedia Commons haes media relatit tae Honolulu, Hawaii. This page wis last eeditit on 27 Julie 2018, at 06:22.